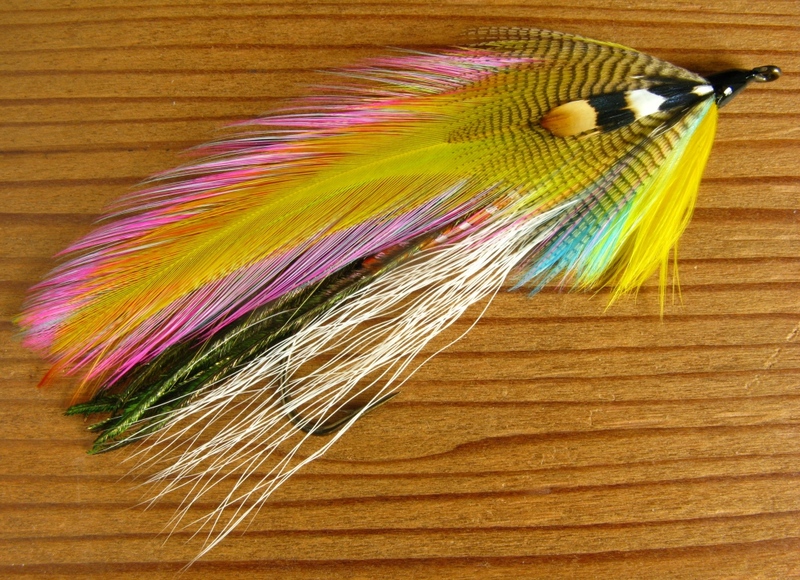 Carrie’s Ghost – original Rangeley style streamer, created, tied, and photographed by Don Bastian. Hook is a size #2 – 8x long, Gaelic Supreme Martinek / Stevens Rangeley Style Streamer. Carrie’s Ghost – a Don Bastian Rangeley style original streamer pattern. 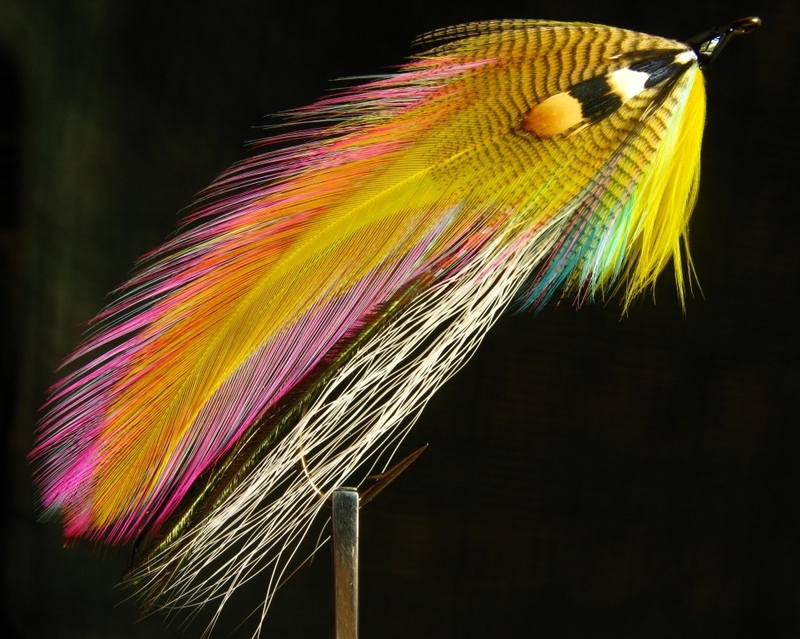 This entry was posted in Fly Pattern Recipes, Streamers and Bucktails and tagged Carrie's Ghost, Carrie's Killer, Original Don Bastian Rangeley Style Streamer Patterns. I think Carrie would have had a huge smile on her face, with this one. Outstanding work Don!! Of these two flies the Carrie’s Ghost is my favorite. I like the colors…thank you so much for your compliment. I hope Carrie would be (or is) 😉 smiling! I think the same as you Kelly, and must have been a great teacher to tie flies, congratulations Don, as always very good job. Thank you for your compliment on Carrie’s Ghost! I truly appreciate your comment, thanks so much! Glad you like the pattern! Recently read on another not to be mentioned page about this fly, the purpose of which must have been taken all wrong by those who criticize its existence. Carrie Stevens created a streamer pattern that is known all over the world and many more of them as well, I really don’t think that she created a ghost pattern and named it after herself, you have a love for all Rangeley streamers and because of this created a fly and named it for one of the main persons responsible for them. We should not be offended by this gesture on your part but be happy that the fly is a beauty to look at. Offense would have been taken if you created something that was less that this. You have put together a beautiful pattern that should be admired for that and the purpose that it was created and those that do not like it can do so quietly. I am truly touched by your reply, being so supportive of my effort in this arena. I am happy you agree with me, naturally, but I appreciate your candor and support of my creation that was as you indicated, wholly intended to be a work to honor and respect and pay tribute to Carrie Stevens, not meant in any way to be otherwise. Personally, I can not imagine how someone, anyone, with could be offended by my fly pattern Carrie’s Ghost. Thank you for your comment and again, for your supportive and detailed assessment of the big picture. I appreciate it very much! Tight threads and even tighter lines! Don, I think Barry hit it right on the nose! Beautiful color combo, and not bad tying for an old codger! I am sure carrie would be both flattered & honored by this. Am I not reading this right or is there no listing for the “underbelly”? Can I substitute goat hair? If I do can I still label it as a “Carrie’s Ghost”? You read correctly, I had forgotten to include the underbelly of white bucktail. And white goat hair would be fine; Carrie Stevens did that on her larger hook sizes when bucktail was not long enough. Nice fly you tied of Carrie’s Ghost, I saw it on facebook! Thanks!